Shell Oil President Marvin Odum (MBA ’95), also Upstream Director for Royal Dutch Shell’s subsidiary companies in the Americas, visited the C. T. Bauer College of Business at the University of Houston for a question-and-answer session to discuss the future of energy and its impacts on society. Cedric Bandoh (left) and Ana Salgado (far right), along with nine other students from the Bauer College, had the opportunity to meet Odum (center) before the event for a one-on-one discussion. 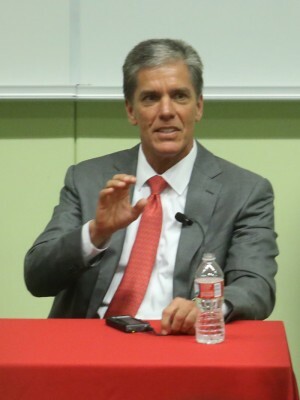 Students from the C. T. Bauer College of Business at the University of Houston interested in energy seized an exciting opportunity in February as Shell Oil President Marvin Odum (MBA ’95) visited the college and spoke on the future of the industry. Odum, also upstream director for Royal Dutch Shell’s subsidiary companies in the Americas, was the featured guest in a special Distinguished Leaders Series, with Bauer Executive Professor of Finance Christopher Ross acting as moderator. A reception before the event allowed students to meet Odum and ask questions about his career and Shell. Dean Latha Ramchand took note of his willingness to engage with students, characteristic of the high level of alumni involvement at Bauer College. The session’s topics included the world’s growing energy demand and environmental concerns. Odum started by answering a question about the industry’s future decades from now and described his job’s key component as thinking about the future and where the energy industry is going. This is one of the most exciting times to join the industry, he said, with the growing population as the biggest factor in the future of energy. Marvin Odum discusses the energy industry’s future and its impacts on society. Sustainability of natural gas was also a popular topic. Odum explained that the world’s supply of natural gas is sustainable for hundreds of years. Another concern, Odum said, is environmental, with questions surrounding that issue taking up more than 20 percent of his time as president. He pointed to the growing population’s energy consumption as what will drive innovation. 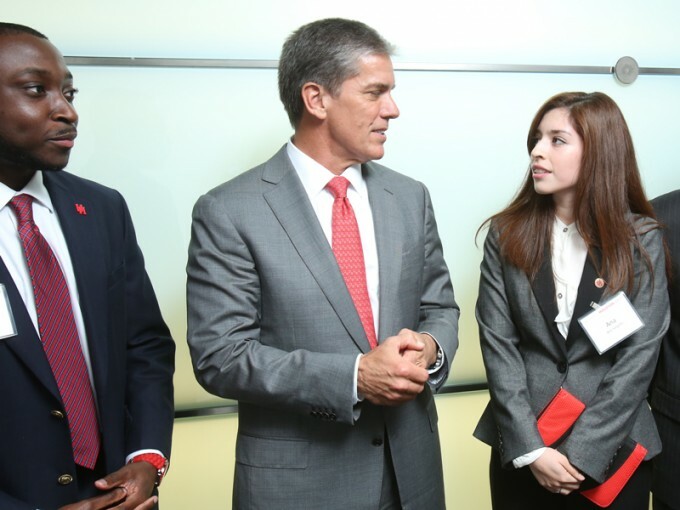 Houston’s diversity and Shell’s global reach was also a focus of the discussion. Diversity in the workplace is an important part of Shell’s company culture, Odum said.